Ed Sheeran is not only one of the most successful recording acts, ever, but one of the world’s most in-demand live acts. 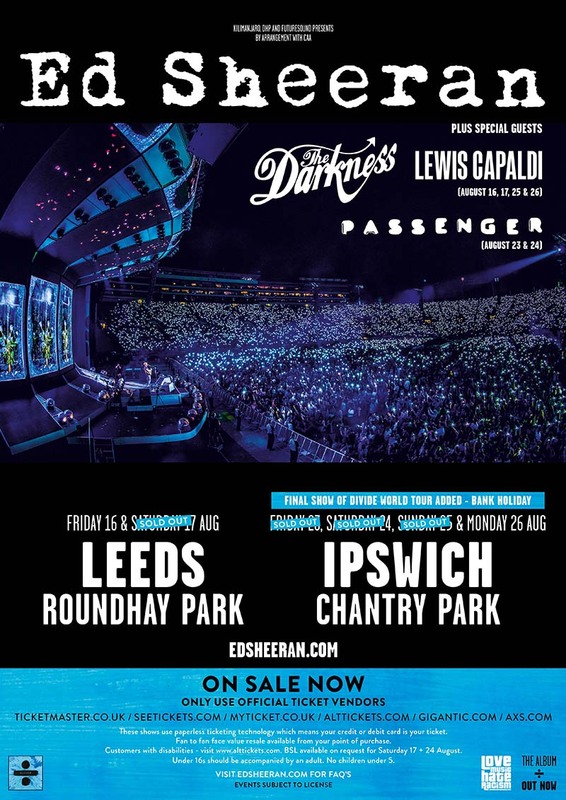 On this summer’s UK run, Ed played to over 1.1 million people, including four nights at London’s Wembley Stadium, marking the biggest-ever solo tour [without a band] that the UK has ever seen! Next year’s dates will see Ed return to the UK for four very special homecoming shows, which will run across two weekends. The official UK ticket vendors are as follows: Ticketmaster.co.uk, Seetickets.com, Altickets.com, Gigantic.com, AXS.com, Myticket.co.uk and Lunatickets.co.uk. Once again, Ed and his team have a strict stance against anyone using unethical secondary ticketing sites. The UK shows on this tour will use “paperless” ticketing technology which means that the credit or debit card of the purchaser of the tickets will become their ticket.